Radcliffe Observatory Quarter, Woodstock Road, Oxford OX2 6GG, U.K. These pages hold a summary of the work I have done in mathematical physics, centred on the development of twistor diagrams as first devised by Roger Penrose. You can go straight to a summary of recent developments, giving links to ArXiv versions of papers. Or stay on this page for a general introduction to the area. TWISTOR theory is the creation of the great British mathematician and physicist, Professor Sir Roger Penrose, FRS, OM. The idea of twistor theory is that space and time should be described in a completely new way using the geometry of twistor space. Then fundamental physics should be reformulated in this twistor geometry. The hope is that a complete and correct description of gravity and quantum mechanics can be given in this new framework. My work is concerned mostly with the quantum mechanics side of this programme. Twistor diagrams, which Roger Penrose first wrote down in about 1970, give a description of how fundamental particles and forces act on each other. Twistor diagrams involved difficult mathematics in many-dimensional spaces. But from the start it became clear that they manifested a strange and beautiful structure, bringing out some amazing properties of fundamental interactions. Work on twistor diagrams made slow progress for thirty years, plagued by mathematical difficulties, and seemed rather remote from mainstream developments in physics. But in 2003 the leading theoretical physicist Edward Witten came up with a new paper which related string theory and twistor geometry. People working in more orthodox research in physics suddenly started taking an interest in twistors. Quantum field theorists began talking about 'the twistor revolution'. And twistor theorists like myself started catching up with the wonderful discoveries that leading quantum field theorists had been making in gauge theory, which is essentially the study of fundamental forces in Nature. My main contribution was showing in 2005 that one of these discoveries (the 'Britto-Cachazo-Feng-Witten recursion relation' for gauge theory), was in fact best represented in terms of twistor diagrams. This came as a rather unexpected and surprising idea, which took until 2008 to be absorbed. In March 2009, Nima Arkani-Hamed, Freddy Cachazo, Clifford Cheung, and Jared Kaplan published a paper ( The S-matrix in Twistor Space ), which greatly extended this idea (by identifying its Grassmannian structure) and made it much more powerful and better known. My Oxford colleagues David Skinner and Lionel Mason did parallel work. In May 2009 I noticed that another new field-theoretic development ('dual conformal invariance') could also naturally be described using twistor structure. This has also proved to be a very helpful idea, but it is only one component of the many further advances made in the summer of 2009 by Nima Arkani-Hamed's group, by my Oxford colleagues, and by other leading field theorists. By September 2009, the fundamental importance of Roger Penrose's twistor-geometric approach had been firmly established. The next stage required the extension of these ideas to encompass the 'loop amplitudes' of quantum field theory. Much of this was achieved in 2010. A new generation of young mathematicians and physicists became involved, and the fast pace of progress was sustained. 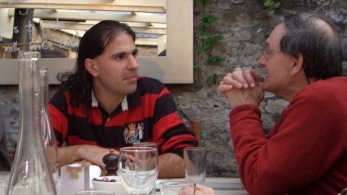 Nima Arkani-Hamed and Roger Penrose meet at the White Hart, Wytham, Oxford, 18 June 2009. For a taste of the 'twistor revolution' in 2011 see this video of Nima Arkani-Hamed's January 2011 lecture at the Perimeter Institute, and these blog comments. In 2012, twistor diagrams came right back into the centre of the theory, when Nima Arkani-Hamed and five collaborators published a completely new account of their properties, making a connection with the advanced geometrical ideas of the 'Positive Grassmannian'. The entire theory of amplitudes in gauge theory has now been transformed. This invited article by me in Nature Physics , 2 April 2013 (needs a subscription to view) describes the impact of recent advances on fundamental physics. This Simons Foundation article on the `amplituhedron' went viral and was reprinted in Wired. A 2014 blog entry by Peter Woit adds comment. Meanwhile there has also been considerable progress in making a connection with quantised gravity, where again I have been able to make a useful discovery. In summary, the work I did slowly and over many years on the isolated margins of mathematical physics, has now rapidly been absorbed into a powerful and central theory involving a number of leading physicists. Roger Penrose adds extra detail about the origin of his ideas in an on-line video entitled Extra Time: Professor Sir Roger Penrose in conversation with Andrew Hodges, from the Mathematical Institute, University of Oxford. S. A. Huggett and K. P. Tod, An introduction to twistor theory, London Mathematical Society Student Texts 4 (New edition, Cambridge University Press, 1994). There is not yet a textbook covering the rapid development of twistor theory in physics since 2003, but this review by Henriette Elvang and Yu-tin Huang is a great on-line resource. You can also continue to my summary of the papers which have taken off from the idea of twistor diagrams and so have transformed the modern picture. Go to a summary of recent developments, giving links to ArXiv versions of papers. I also have another area of research and publication: the history and philosophy of computing, stemming from my biography of Alan Turing. See my Turing Publications page. Technically, this is quite separate from my work in twistor theory, but there is an underlying connection because of my interest in Roger Penrose's theory of uncomputability in physics.